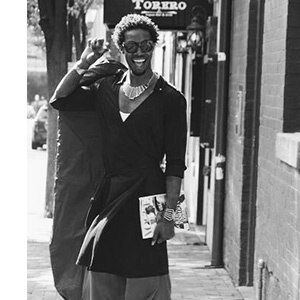 Jonathan Copeland, is a freelance fashion stylist, and publishing entrepreneur. Having gained experience in fashion blogging and social media marketing for his brand “In My Fashion Styling”, visual merchandising and sales for affordable luxury fashion brands, as well as fashion show and photoshoot production, ultimately, he strives to help others recognize fashion as a tool for empowerment and expand our perceptions regarding the meaning of beauty. Currently, he is a Visual Merchandising Team Lead for Target, Fashion Editor for CEO Magazine, Boutique Manager for the non-profit, Dress for Success Central Virginia, has contributed to various publications including, Richmond Magazine, and Style Weekly. He is sought after to organize fashion shows for various organizations and special events, most recently collaborating with the VMFA and the annual Richmond Diner en Blanc soiree. He also is a fashion educator and program leader for the non-profit, ART180, and works closely with the VCU Fashion Department and other youth programs on special service learning projects. Follow his journey on Instagram at @imfstyling.